Charles Ray Hunsinger (July 25, 1925 – March 23, 1998) was an American college and professional football player who was a running back in the National Football League (NFL) and the Canadian Football League (CFL) for six seasons during the 1950s. Hunsinger played college football for the University of Florida, and thereafter, he played professionally for the Chicago Bears of the NFL and the Montreal Alouettes of the CFL. Hunsinger was born in Harrisburg, Illinois in 1925. He attended Harrisburg High School, and played for the Harrisburg Bulldogs high school football team. Hunsinger attended the University of Florida in Gainesville, Florida, where he was a running back for coach Bear Wolf's Florida Gators football team from 1946 to 1949. He rushed for 2,017 yards in his college career, with 842 yards in 1948 and 774 yards in 1949. Hunsinger was popular with the Florida student body, and the "Humdinger Song" (including the lyric "Hunsinger is a humdinger") was written by a pair of Alabama sports writers and sung by students. Memorably, in 1948, he had a 96-yard kickoff return for a touchdown against the Alabama Crimson Tide, and his 842 total yards for 1948 would remain the Gators' single season rushing record until it was broken by Nat Moore in 1972. 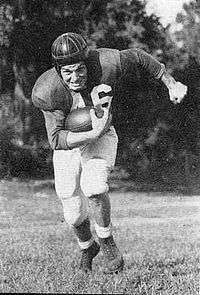 Hunsinger had two outstanding games in 1949, rushing for 199 yards versus the Furman Hurricanes and 174 yards and three touchdowns against the Georgia Bulldogs. He was a first-team All-Southeastern Conference (SEC) selection in 1948 and 1949. Hunsinger graduated from the Florida with a bachelor's degree in 1950, and was later inducted into the University of Florida Athletic Hall of Fame as a "Gator Great." 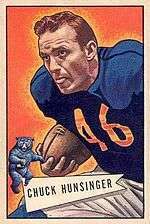 The Chicago Bears selected Hunsinger in the first round (third pick overall) of the 1950 NFL Draft, and he had a three-year career with the Bears, from 1950 to 1952. He played thirty-four games in all, rushing for 834 yards (his best year was 1951 with 369) and catching twenty-three passes. Hunsinger also returned punts and kickoffs, and was the fourth-ranked kick returner in the league in 1950, averaging 28.6 yards per return. "I was right back and the play was a sweep to the left. Their right tackle broke through and I saw I wasn't going anywhere, so I decided to pass. . . . Just as I was about to throw, someone hit me from behind—not hard, mind you—but enough to shake the ball loose. Somebody was lying across my legs and I was sick when I looked up to see Jackie Parker taking off down the field." Canadian Football Hall of Fame great Parker returned the ball a record ninety yards to score the game-winning touchdown. It was one of the greatest plays in Grey Cup history. Hunsinger recounted picking up his wife at Toronto's Royal York Hotel after the game, and heading straight home to Harrisburg with a sick feeling in his stomach. He also recalled the elation of arriving at his home to find an 800-foot-long "Cheer up, Chuck" telegram with the signatures of 21,947 Montreal Alouettes fans. 1 2 Pro-Football-Reference.com, Players, Chuck Hunsinger. Retrieved June 26, 2010. ↑ databaseFootball.com, Players, Chuck Hunsinger. Retrieved June 3, 2010. 1 2 3 4 5 2011 Florida Gators Football Media Guide Archived April 2, 2012, at the Wayback Machine., University Athletic Association, Gainesville, Florida, pp. 96, 98, 127, 139–140, 148–149, 182 (2011). Retrieved August 28, 2011. ↑ Noel Nash, ed., The Gainesville Sun Presents The Greatest Moments in Florida Gators Football, Sports Publishing, Inc., Champaign, Illinois, pp. 11–13 (1998). ↑ Jack Hairston, Tales from the Gator Swamp, Sports Publishing, LLC, Champaign, Illinois, pp. 58–60 (2002). ↑ Pro Football Hall of Fame, Draft History, 1950 National Football League Draft. Retrieved June 26, 2010. 1 2 National Football League, Historical Players, Chuck Hunsinger. Retrieved June 3, 2010. 1 2 CFLapedia.com, Players A–Z, Chuck Hunsinger. Retrieved February 29, 2012. ↑ Milt Dunnell, "A replacement for Hunsinger," The Toronto Star (January 4, 2008). Retrieved June 26, 2010. ↑ Jim Kernaghan, column, The Toronto Star, p. 14 (November 27, 1968). See also Canadian Press, "21,947 in Canada Sign Wire to Cheer 'Goat'," The New York Times, p. 48 (December 7, 1954). Retrieved June 25, 2010.